"Celebrate! You've made it this far, and the next challenge is to hold a party for your friends and family (at least four guests, you can include yourself in the 4 person count). Whether you're an experienced host or an entertaining newbie, get creative and host a luxurious dinner party where your guests will discover new tastes and exotic flavors. Share your hosting secrets with readers, like how to cook for a crowd, plan a menu, or involve guests in the prep." Wine is a community builder. It can create a bond between strangers who find themselves tasting and sharing their thoughts on the bottle they have experienced. With my vino-philosophy in mind, I invited my dinner guests to bring a bottle of California wine to the dinner and with 48-hours notice, I would create a dish to pair with their offering. 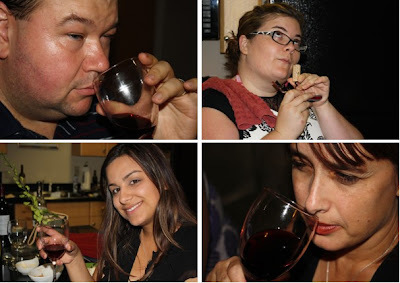 My friends are always offering to help, and this allowed my guests to be active contributors to the party while leaving them guessing how their wines would be paired. While I did the research, pairing, and cooking; I added a teacher-twist to the evening by asking my guests to explain what wine they brought and why they chose it. You can take the public-speaking teacher out of the classroom but she will still encourage everyone to speak in an intimate environment involving wine and food! This got everyone involved in conversations about the wines while I brought the dishes to each of my guests. Since I am participating in the Physicians Committee for Responsible Medicine 21-Day Kickstart, I decided to prepare an all-vegan menu for the evening, a first for my entertaining résumé which meant lots of research. In doing my research on pairing vegan menus with wine, I learned something new about wine-making. Most wines aren't vegan! Both conventional and organic wine makers use "animal products" to keep wines from turning cloudy and/or removing "off-tastes." This process is called fining and works by an agent acting like an electrostatic magnet to collect the unwanted matter. Although non-animal alternatives exist, the more common agents used are egg whites, casein, gelatin, egg albumin, and isinglass (derived from fish). While the fining agent is removed from the wine before bottling, there are still animal products used in it's production. Unfortunately, I had already asked my friends to choose the wines, and several had already picked special wines for the event. I encourage strict vegans to investigate before purchasing wine to ensure it meets your standards. I could not find any of the wines I served on vegan-friendly wine lists, so while my dishes are vegan, the wines may not be. However, these dishes were prepared to pair with regionally grown varietals and could be paired with wine from a vegan winemaker as well! Pairing food with wine is an art. However, you don't have to be a pro to celebrate local wines and foods. While most wine guides reference meat and cheese pairings, you can create the perfect pairing without animal products. In fact, according to Berenice Madrigal-Galan and Hildegarde Heymann at the University of California at Davis, eating cheese can significantly alter the flavors of red wine. So let's explore some simple pairing guidelines that you can use at your next party, as I share the dishes I prepared for my guests! Check with the Winery! My friends Susan and Rob introduced me to J Vintage Brut through a tasting experience in the J Winery Bubble Room. This wine and food pairing experience changed how I saw pairing wine and food, because the food was created to pair with the wine instead of finding a wine to pair with a dish you are already preparing. When Susan told me they were bringing J Vintage Brut to the dinner, I took a quick peek at the winery Web site where I found a dish I adapted to be vegan. Many wineries offer pairing ideas and recipes that have been created to serve with their wines, so I encourage checking out their Web sites while preparing your menus. In the case of this fresh peach gazpacho, I substituted agave nectar for the honey and soy yogurt in place of traditional yogurt. Acidity: Pair acidic foods with wines that have a higher acid level. Tomatoes and citrus make for a lovely salad, but you don't want to drown out the subtleties of the wine you are enjoying. While acid levels in wine vary based on region and winemaker, Sauvignon Blanc is a wine that is generally on the higher acid spectrum. I prepared the avocado by mashing it with a little lemon juice, salt, and chili powder before piping it into the hollowed Compari tomato and adding a wedge of locally-grown grapefruit. Body & Weight: Look at the weight of both the food and wine you are serving. I don't mean break out the scale, but rather consider the mouth feel of both things you plan to serve together. Wines range from having a light feeling to a heavier taste in your mouth and your food should match that weight. In this pairing, the lighter body of the rice salad matched the mouthfeel of the Pinot Noir, while the sweet spicy flavor of the roast squash brought out the earthy notes of the wine without weighing it down. Trust the Classics: One of the reasons I decided to write about wine pairing in my dinner party post was the lack of research I turned up while looking for vegan pairing suggestions with the majority of pages I found addressing vegetarian dishes full of egg and cheese. However, I scoured guides from the pros like The International Guild of Professional Butlers to help me when I was at a loss. Specifically when a guest told me she was bringing Merlot but couldn't remember the name of the winery. Without winemaker notes or a region, I looked to a classic pairing of ratatouille suggested by the IGPB. Read Winemaker Descriptions & Find Complimentary Spice Levels: California Zinfandel tends to have strong tannins, spicy characteristics, and high alcohol content. When my coworker decided to share his prized Nalle Zinfandel Reserve, I knew I had to find a dish that was flavorful enough to stand up to the description from the winemaker. Mustard has a spicy character that reminds me of the described "cigar box" qualities of the Zin while mushrooms enhanced the earthy notes of the wine. Incorporate the Wine in the Dish! Using the guidelines above, your guests can enjoy varietals in the glass and on the plate when you integrate the wine into the cooking. I did this at both the beginning of my dinner with the gazpacho, but also brought the dinner to a close with Cabernet Sauvignon served two ways. I made a sorbet out of a Cabernet from another region of California, adding color to the dish with chopped mint after reading the winemaker include mint in the description of the wine we were drinking. Sweet chocolate pairs well with dessert wines, but dark chocolate is delicious with more structured red wines like this Cabernet Sauvignon. I loved the opportunity to prepare this dinner party because it gave me a chance to introduce vegan cuisine to wine-loving friends who couldn't believe a paired six-course meal could be successful without cheese and meat. I have included the complete menu with wines below as a reference guide. I hope it was as educational and enjoyable for you to read about as it was for me to host! J Winery has clarified their sparkling wines are vegan but still wines are not. Lucas & Lewellen has been vegan-friendly since 2007. Bogle and Nalle are not vegan-friendly. I have yet to hear back from EOS and Lava Cap. All I have to say is wow! Sounds like a great & tasty party! 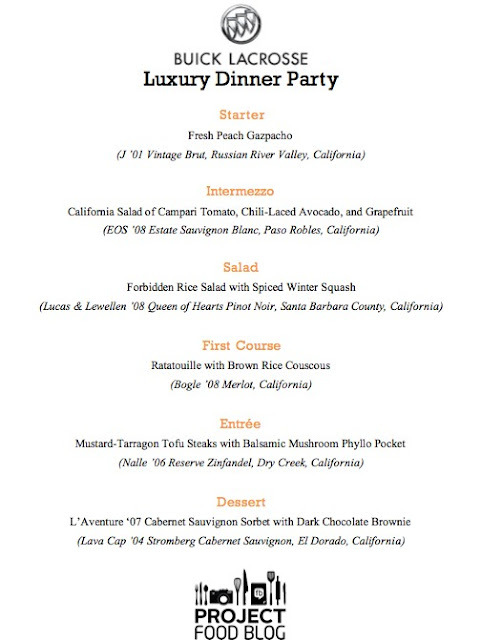 A very elegant vegan menu and the wine pairings are excellent! Hi CG! Thanks for making me your OCtober Follower of the month!! I didnt make to the 3rd round, but Im still updating myself from reading all the contestant's post. You're one of the unique entries ive read. A spread of a very elegant full course menu plus wine pairing in each course is really challenging. It's like having a tour with Napa Valley with you. pairing strict vegan meals with Red wines is really a bold challenge for me, and making vegan dishes alone as well. Kudos for you for successfully putting up a very impressive and unusual luxurious dinner party! I only wish I had been one of the lucky attendees. I'm voting for you right now! Loved, loved your concept of having your guests participate in the dinner by letting them bring their favorite bottles of wine. Plus kudos to you for making something that would go pair well with them. You're definitely a pro! Well done, my dear! I too was lucky to be a guest of this wonderful dinner party! Since I am not used to eating vegan food, I was especially impressed to find such great flavors in vegan dishes! The wine parings complimented the dishes well. It was fun to be included in the wine choice and description. What a fun and intriguing pairing lesson. And it is great entertainment for a party. It really breaks the ice. THere is SO much about your post that I love: The info about the wine is so interesting, having your guests talk about why they chose, etc.. is such a great idea, and I think I'll be making that squash dish this weekend, was looking for something just like that. Fantastic job! You got mine! Who knew vegan could be so delicious! You've got my vote. Love your menu! It all looks great! Hope we both make it to the next round! :-) You have my vote! I love how you got your guests involved, i think thats an awesome personal touchpoint! The Fresh Peach Gazpacho looks delicious. I've been wanting to make Ratatouille for some time. Good luck! I'm sending a little red heart your way! Carol-this is an AMAZING post! I love it and you--so glad we got together tonight and chowed DOWN at Chez Panisse!! You really pointed out the most important things about wine-food pairing for the vegetarian. As a vegetarian sommelier myself, I've done a lot of research about vegan wines and there are quite a bit out there that ARE vegan and not labeled that way. Most French wines from Cotes du Rhone and the Loire are unfined... and in America, many value wines, like Guenoc are not fined with animal agents because they are too expensive to use! (lucky us!) Looks like you enjoyed a great meal. This looks delicious and healthy! I love healthy foods like this. I like to share some healthy recipes which I found at www.gourmandia.com and www.gourmetrecipe.com. Your Project Food Blog Challenge article “Vegan Food and Wine Pairing: A Six-Course Adventure” is amazing, your dishes and wine and food pairing are exquisite; we are sure your guests were the bubbling over with excitement to have been invited to partake in your delicious menu. In addition we are overjoyed our Bubble Room wine and food pairing experience changed how your perspective of pairing wine with food, we appreciate your friends, Susan and Bob, for introducing you to our J Vintage Brut as it an honor to have been a featured wine at your delectable dinner. We look forward to reading more on your upcoming Project Food Blog Challenge as you offer education with entertainment, also a perfect pairing in sharing with your friends and follower. Cheers! Hi! I was researching vegan pairings for a wine tasting that I will be doing and a friend came across this article. What a great menu! Thank you for educating about vegan foods and wine pairing and also about how to know if a wine is vegan or not. I did not realize that all wines were not vegan!